As any parent knows it's hard to rest when you have children. It's also difficult to care for children when you are injured. My leg is still in a splint and besides medical appointments I have not left the house all week. Definitely no nature walks. Otis has been getting restless. I have been searching our cupboard for any old toys of Caspar's that might slightly interest him. Luckily I've found a few. I also remembered how much Caspar loved this scooping activity and thought Otis might just get it. With a very low grip and a firm hand Otis worked it out. You can't see in these pictures but he did get very wet. This was almost too difficult. It's a fine balance. We want to challenge our children without making the challenge unachievable. I don't want the activity to end in frustration or with a defeated child. Otis also used his hands after a few minutes then went back to the scoop. This was totally ok with me. It was a fun activity and he was working hard. Aim: Create new activity for Otis using items already in the house in under five minutes. Method: Drill holes in recycled containers and present with matchsticks for a threading activity. An oldie but a goodie! I almost feel silly posting something so simple but these are the things we do! This container was recycled and could be used for so many things. 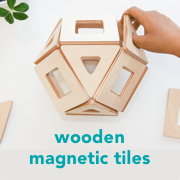 It could be used for a coin box or shape sorter. Hannah recently mentioned in the comments a similar activity using blunt kebab sticks. Paddle pop or craft sticks would be good to use too, just cut the hole to size. I thought about making the holes larger but when I gave it to Otis to try he had the coordination to get the sticks in. As I couldn't remove the label I covered the container in brown paper and contact. Not one to stop at one activity I drilled a hole into another container. This label was easy to remove. While this container needed to be held it was really easy for Otis to open, get the sticks out and close again - which he liked a lot and gave him satisfaction in being able to complete the entire cycle himself. This is the same activity exactly as I presented to Caspar many years ago. Otis liked this but was disappointed that he couldn't open the lid. This stayed on Caspar's shelves for around a year, yes indeed it was a favourite. There are a few activities that I don't like to store in his room. I keep these activities in our living area where he can access them independently but while he is supervised. I doubt he would hurt himself with the sticks but I think it's better to be safe then sorry. On this occasion he did use them in his room but I was with him the entire time. Yesterday morning I gave Otis tongs for the first time. I gave him a brief demonstration and then let him play. It was fun watching him work it out. I didn't give him a bowl or do any transferring, simply tongs and some food. Within about five minutes he was able to use the tongs to pick up his strawberries. Not long after I strapped Otis into the Ergo. I overextended my knee and suffered a dislocation. Ouch. Have you ever fallen with your child in a baby carrier? Otis was fine but it was really scary. It was also a big wake up call for me. Later the physio pointed out the my lack of physical strength contributed to the fall. I realised that it's time I looked after myself just a little bit more and started some regular exercise. So while now I'm almost completely immobile very shortly it will time to build strength. Oh, I don't even know where to start! Back to things Montessori, I still have some mobiles to show you. I'll have at least one more post over the weekend featuring babies and their mobiles. There are some wonderful mobiles too. I have decided it's time to introduce some sponsors to this site. I don't know why I waited so long. I tend to over-think these things. Welcome to Montessori Shop and Montessori Child. If you are interested in being a sponsor please email me Kylie, at howwemontessori@gmail.com. Also a huge congratulations to Amy and Steve from Montessori Child who have just welcomed their second son and brother to Van Oak into the world! Welcome little one. Charlotte who wrote Let's talk about Screen Time Part One and Part Two is working on a book about Montessori in the city. She is looking for contributors who can share their experience about Montessori in urban areas, the challenges you may face and how you overcome them. I straight away think about the challenges of living in small spaces and taking nature walks within a city. If you would like to contribute please email me (howwemontessori@gmail.com) and I will forward your email directly to Charlotte. I am a little wary of giving an exact release date for our Kids in the Kitchen cookbook. I think we seriously underestimated the time it takes to finish a project like this. I guarantee it will be worth the wait and the book will be realised within a couple of weeks. When the book is ready I will be hosting a Kids in the Kitchen week. I have some great giveaways and fun kitchen activities planned. I will also be answering my FAQ's for the kitchen (so please leave any questions you have but never asked). I would also love to feature some Montessori kitchens. If you have a Montessori inspired kitchen, perhaps some low shelves for your child's utensils, a food preparation/snack area for your child, please feel free to email me your photographs. Be it mobiles for infants or spaces like the kitchens it's wonderful to share and get ideas from each other. I'll also be sharing our kitchen and how it now looks with the inclusion of Otis. Just in case you are interested, I found this Classroom Observation Guide from Montessori Madmen. When I first observed a Montessori classroom this information was provided to me immediately before the observation. It would have been great to read it beforehand. If you are thinking about observing a Montessori classroom this is a really good article to read first. I'll be back tomorrow with a very simple hand made material for Otis. Caspar has sewn with me many times before. Sitting on my lap he loves to use the sewing machine. It was time for me to take that leap of faith and allow him the opportunity to sew by himself. Take ownership of the project. Step in the Cloud9 Cut and Sew Panel. A fun way to engage my little sewist. Cut, pin, cut, sew, stuff, sew! Yes, he did prick himself with a pin a couple of times but nothing more than an ouch. I don't sew with a foot pedal either so it was easy to show Caspar the stop and start button. I love how the cushions have turned out perfectly imperfect! Playdough - tools or no tools? Are we limiting our children's creativity by overwhelming them with choice? By giving them too much? By dictating how they will play? Otis is still so young. So much to explore. When I've given him playdough before, I've just given him plain playdough. Then recently with Caspar they started to use tools. The good old rolling pin and cookie cutters. Otis just copied Caspar. Then on another occasion out came some decorations - matchsticks, pipecleaners, you know the like. Once again Otis followed his brother. Now on his art shelf Otis has a few tools with his playdough. But it makes me wonder. Perhaps he is better without them. To feel, to squish, to roll, to pinch, to create. I think I might put the tools away for a while and just see what he does. Perhaps teach him to roll a ball, make some snakes, go back to basics. I love the colour of this playdough. I've used beetroot powder, still no problem if he decides to have a taste. 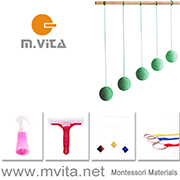 Montessori infant mobiles - would you like to contribute? I am a huge fan of Montessori and Montessori inspired mobiles. Often I receive photographs of mobiles being used by infants from around the world. Oh how I love to see children joyfully engaged with their mobiles and nurseries decorated so beautifully in a Montessori way. I would love to share some of those photographs here on the blog for others to see. If you have a photograph of a space including a Montessori or Montessori inspired mobile that you would be happy to share, I would be delighted if you could email me. If you include a caption of who the space is for or which mobile is featured, that would be wonderful too. If your photograph appears on your blog, I'm more than happy to provide a link to your site, just email me the link. I look forward to hearing from you. You can contact me at howwemontessori@gmail.com. I originally set this up with six tubes and a rectangular block. Otis made it clear that he would rather sit and only used the bottom tube. Because I was with him, working in the kitchen, I gave him some small pom poms. He also used matchsticks and paddle pop sticks. You can tell when the child is engaged. Repetition. Over and over again. After re-arranging and using only two tubes, Otis thought this was ok too. This could be the easiest and cheapest activity I've posted yet! We were at a party over the weekend and I noticed Otis happily playing with a single feather. A friend brushed it against his face. His smile widened and he closed his eyes. He loved it. Today a bucket full of feathers, lots of tickles and lots of giggles. Does Australian Aboriginal art inspire you? Images from Papunya painting - Out of the desert. Edited by Viven Johnson. We visit the National Museum Australia regularly and have an on-going discussion about the first Australians. It's an important discussion. Caspar recently asked "Why do we speak English?". Really good question. We have been reading Dreamtime stories which have captured Caspar's imagination like no other. They appeal to his boyish nature. We know that Aboriginal art tells a story, it always has meaning. We've researched symbols. We collected and explored natural mediums. Ochre is unique and is very different from paint. First you need to grind it and then mix with water to make a paste. The colours are rich and deep. We painted sticks, rocks, leaves and bark. Some dot paintings, some abstract designs. To really appreciate Aboriginal form I introduced the Brave Ant colouring book. For Caspar it provided a structured way to experience Aboriginal art. Otis had some fun too. I love this painting of his because of the colours - knowing it was made with the colours of our earth. This is a child sized easel which I've shortened by a few inches. Now it's the perfect height for Otis. He uses it everyday. Not always for painting, he will draw here too. We use different types of brushes. I don't know which is best. This one is called Roymac Chunky and has a bulb shaped handle. We use a range of colours but only one colour at a time. We've tried fancier types of painting like painting with string and wool but that just turned into finger painting. Painting with a sponge was successful so I've kept a container and sponge on his shelf. I remember Kate mentioning her daughter Sarah likes to put sponges in her mouth, if this sounds like your child painting with a sponge is probably not a good idea. We use children's acrylic paint, water colours and we've recently been painting with ochre. Giotto be-be pencil crayons came highly recommended as 'first' crayons. They are soft and easily mark the paper. Honeysticks may be the most eco friendly choice and yes they smell fantastic. Made from 100% natural beeswax and non-toxic pigments. I love that they're made in New Zealand. Stockmar Wax Blocks are our favourite. The colours are great. Caspar used these for years and they're still going strong. I love the little tin. Nice enough to take out. Crayon Rocks look suitable as first crayons however I cannot find them in stores locally. Are they worth ordering? I'd love to hear any other 'first crayon' recommendations. Have you noticed that Otis looks like he's right handed. When Caspar was so young I couldn't tell but Otis has made it pretty clear. Anyone else picking up on hand dominance? A shelf for Caspar (4.5 years), a shelf for Otis (14 months), heaps of storage and hanging space. The cupboard has two doors which Otis cannot independently open yet. But when he can it's totally ok.
Caspar can reach various paints and painting tools, clay and clay tools, stamps, various glues and fixatives, art aprons and an art caddy. He can ask for help to reach other materials and if there is something he's using often it's easy for me to move it within his reach. Otis can reach his crayon bucket and book, playdough with tools, paint pots, his art smock and his easel. Here Otis can show me exactly what he wants to do. Shall we draw Otis? Perhaps some painting? You choose! My next post will include some of Otis's art activities. I also have a lovely post planned for later in the week featuring Caspar creating will all that bark stored up on the wooden tray. I hope you are interested in some art posts this week.